Let’s work together to create a thriving local food economy! 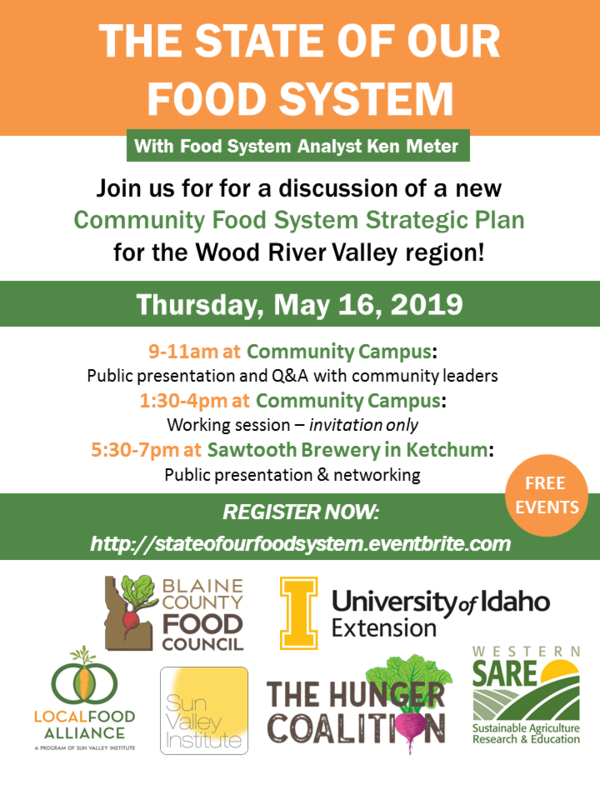 Join us on Thursday, May 16, for a discussion of a new Community Food System Strategic Plan for the Wood River Valley region. Food system analyst Ken Meter of Crossroads Resource Center conducted 61interviews of food system leaders and analyzed regional economic data to come up with key action steps for our community. The strategic plan is already leading to more unified action and new collaborations including a Wholesale Producer Partnership. On May 16, Ken returns to the Wood River Valley to present his findings to the community and help us develop plans for impactful solutions. Come learn more and get involved! The State of Our Food System events are co-hosted by Blaine County Food Council, Local Food Alliance, Sun Valley Institute, The Hunger Coalition, University of Idaho Extension, Western SARE, and Sawtooth Brewery.